I'd intended to post about the Chicago Flower and Garden Show that Mom and I attended last weekend, but sometimes things happen that take precedence over other things. As I was working on my flower show post, Romie stuck his head in the door and asked me if I'd seen Luna today. "Yes, I saw him this morning when I left for work." 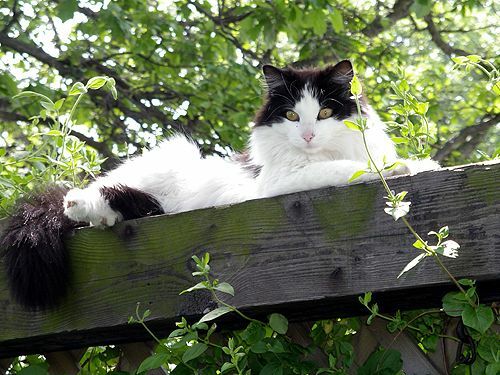 The neighbor had just walked over to tell us there was a black-and-white cat laying on the bridge. She'd heard him get hit this morning and wondered if it wasn't ours. Romie walked down to the bridge as I awaited the news with a sick feeling in my stomach. When I saw him walking back with the cat, I knew it was our Luna. Luna came to live here when he and his littermates were part of what we surmised was a whole barnload of cats that were dumped at the cemetery near our house. 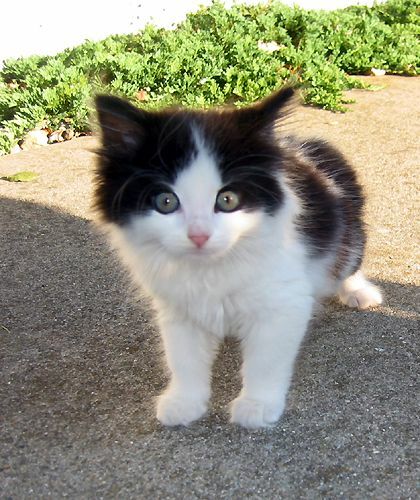 There were cats of least three different ages, with the five kittens being the youngest. We think they weren't much more than four or five weeks old when we found them in August of 2004 in a muddy field of weeds. We brought the kittens home and gave them all baths and fed them some canned kitty food we just happened to have on hand. At that time, we only had one outside cat, Jinx, and one inside cat, Simon. We named the new kittens Oreo, Boo, Augie, Baby and Luna. Each of them got their name for a reason. 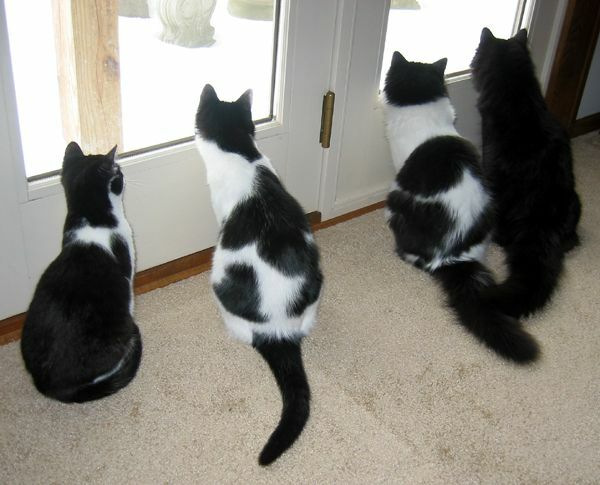 Oreo was a short-haired black-and-white, Boo was a long-haired black, and Baby was a short-haired black-and-white that was the runt of the litter. Augie was a short-haired black-and-white and since we'd already used Oreo, we shortened "August" since that was when we'd found them. That night, there was a full moon, thus Luna got his name. We called Luna our hippie cat, because of his carefree personality. He didn't care if he had clean fur, likely because he knew it was just going to get dirty again anyway. We were always happy when he got caught in the rain because he licked himself dry and got clean in the process. But soon, he was off having good times once again and before you knew it, the white fur wasn't too white anymore. Luna enjoyed hunting across the road around our neighbors metal barn. The native grasses are allowed to grow tall there and being a good mouser, he knew where to find them. Though we live on a road that doesn't have much traffic, we had commented numerous times that one day he was likely to cross it at the wrong time, but we tried not to think about that. Now that day has come, and Luna is wearing angel wings. (Thanks, elayne, for telling me that.) We'll miss him and we'll always remember his good-time, laid back personality and his squeaky meow. He has joined our other beloved pets in the garden and over the rainbow bridge. She is now gets to run in the prettiest garden ever! I do believe kitties all go to heaven. Cherish all the wonderful memories and love she gave back to your family. What a lovely tribute to beautiful Luna. He found heaven on earth here with you when you took him and his family into your generous hearts. May your happy memories sustain you while you have this hole in your heart. God Bless. Luna may not have had a long life but it sure was a good one with kind people, other kitties and a big garden and even more outdoor space to live in. Rest in peace sweet Luna. He was beautiful! Many special, fun-filled years he had with your family. Stray cats are mighty fortunate to be dropped off within your line of sight :-) I too believe I can see my beloved pets again in heaven and you will too. We lost my son's puppy to drowning last weekend, plus three other longtime pets inthe last three years. But the joy they bring while they are here is worth suffering the loss when that time comes. Enjoy his sibs, let them make you smile again. My heart is with you in this time of sadness. PS: Sorry I missed you at the flower and garden show too! I'd been there all day on Sat. and just couldn't muster the enthusiasm to make it out on sunday. Luna was stunningly beautiful with personality shining out from his dark eyes. 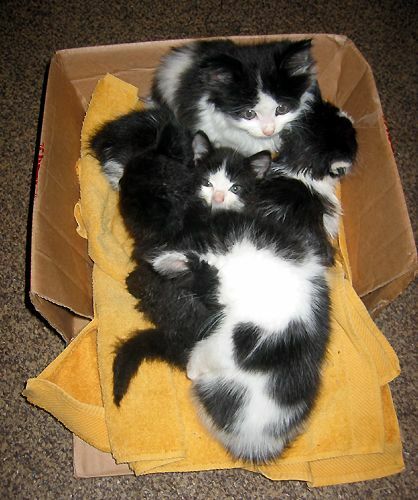 The picture of the kittens in the cardboard box is absolutely adorable. Wish I could pick Luna up and give him a big squeeze. His laid back essence reminds me a bit of my cat Fisher. Great that you have all these marvellous pics to remember him by. Hi Kylee. I am so sorry about Luna. Such a pretty baby too. We get so attached to our pets which is the way it should be I guess. So many are dumped off here in my rural area too. I hope you had a wonderful time in Chicago. I'm sorry to hear the sad news Kylee! It's never easy to lose one of our furry friends. We lost our kitty Amber in December of 2008, it was expected since she had kidney failure but it wasn't easy. Luna was a very cute cat! Beautiful post, Kylee, and gorgeous photos of Luna. 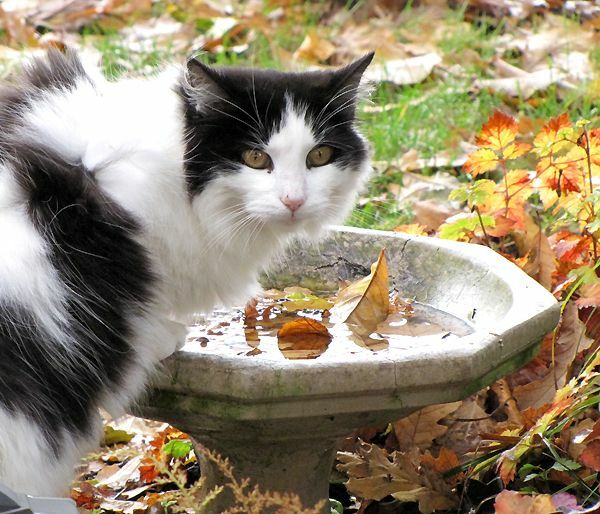 I love the one by the bird bath! The siblings are so cute - all the same, but all different! That's got to be the worst way to lose a pet. Hope your other kitties stay safe. Love the new template as well. Kylee, I am so sorry for your loss. Your memorial here is very touching. So sorry, Kylee. 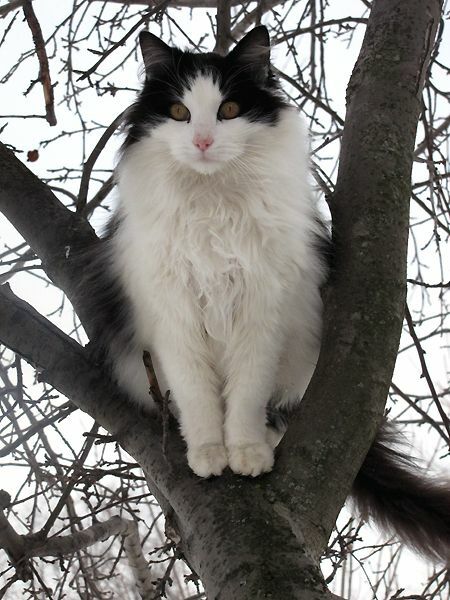 He was one gorgeous cat. I know how you must feel, we've lost a few of our own. Bren~ I can just picture him running around with Jinx again, just as they did when they were both here together. Diana ~ Thank you. He gave us nothing but joy and we loved him right back. Garden Chick ~ Yes, he was a very beautiful cat. I'm so very sorry to hear about your son's puppy. My heart goes out to you! jodi ~ Most people do think Luna is a she, and most Lunas ARE shes, but well, we had a female dog named Simba, too. :-) Thanks so much for your hugs and love. And Kleenex. J-Dog ~ Thank you. Pet owners just know. 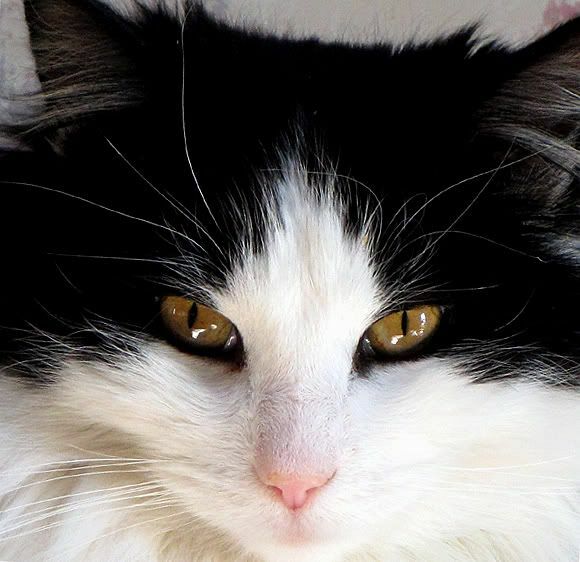 Sarah ~ I'm so glad you can see Luna's purrsonality through the pictures. They all have their own, don't they? We'll sure remember Luna with much love. Lona ~ Thank you, Lona. Yes, we sure do get attached to them and it doesn't take long either. We had a great time in Chicago. Watch for a couple of posts from me about that! Dave ~ I'm so sorry to hear about Amber. It's never easy, no matter how it happens. Jennah ~ Luna drank from every water receptacle we have. LOL. Yes, all the kitties in that litter are adorable. You should see Boo's baby pics. So cute, he's hilarious. Really! We are pretty sure that Luna didn't suffer at all. It was instantaneous, for which we are thankful. Yes, I thought Our Little Acre could use some sprucing up for spring. Thanks! Beth ~ Thank you, Beth. Kim and Victoria ~ It's neer easy, is it? But we wouldn't be without them either. Sorry to hear about Luna! And good for you for neutering your cats, it's so sad when there are just too many and not enough people to take them in. Awwww, I'm so sorry. Luna was a stunning beauty! I am glad you give all those cats a chance when no one else does. 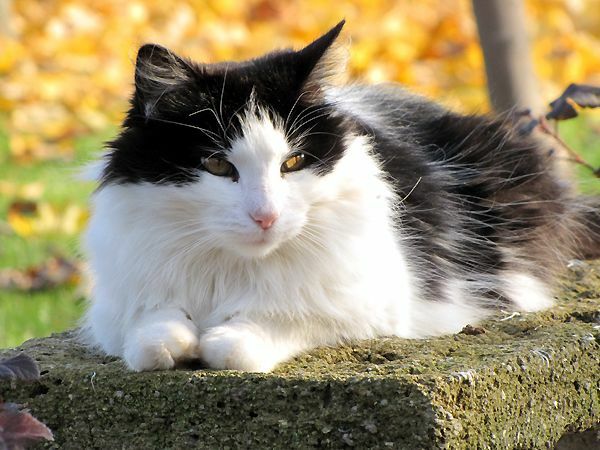 What beautiful portrait shots of your sweet cat. I am sorry to hear he is gone. He was such a handsome cat. Awwe sorry to read about your loss Kylee. What cuties, all of them. Cats have a way of finding owners not the other way around. All of ours have come from rescues and few just showed up at Chiot's Run (I think in the kitty rumor mill it's passed around that you can get a good meal here, no questions asked). Good for you for rescuing cats and spaying/neutoring them. I am so sorry to hear about Luna.I feel as if I know you from reading your blog every week. I had read all about your cats too. Luna kinda reminds me of my baby Izzy. Its hard to lose a part of your family and you are in my thoughts today. Very nice cats and pictures. I'm so sorry to hear about Luna. That had to be so hard for Romie to carry him home like that. I makes me want to hug my kitty a little closer tonight. Kylee, I am so sorry for your loss. As an animal lover myself, I know how much a pet can find a place in our hearts and how sad it is to lose one. Luna was such a beauty; he was lucky to have found such a wonderful home with you. Another blogging friend stopping in to express her sympathy. Your post was a very special tribute. Take care. I am so sorry to hear about Luna. What beautiful pictures and a wonderful tribute. So sorry to hear about this, Kylee. I didn't realize you had recently lost a cat friend. Michelle ~ We do what we can. Jane ~ Thank you. We love our kitties and try to do what we can. Lisa ~ Thank you. Yes, he was a beauty. Melanie ~ Thank you, Melanie. Kerri ~ Oh you can bet he's whooping it up in Kitty Heaven! He was all about having fun. Chiot's Run ~ I think that rumor has been going around here as well! They somehow find their way here. We wish we could help more of them, but it gets so expensive. Jean ~ Thank you, Jean. Luna is missed, that's for sure. Robin ~ Yes, it was hard for him. He's such a softie when it comes to animals, especially our kitties. He does almost all the care for them. They're his babies. Shady Gardener ~ Thank you, SG. Judy ~ Thank you. That's a wonderful quote. Kaarina ~ He was handsome, that's for sure and he had a great time here with us and the other kitties.